Leaders of the House Transportation & Infrastructure Committee continued to discuss the elements of a multi-year surface transportation authorization bill. Once the legislation is completed and approved by the full committee, the plan is to move quickly for full House passage. This could occur by mid-October, but it will depend on the House Ways and Means Committee’s progress finding a funding source. APTA continues to work with House committee members and staff on issues our members would like to see in a final bill. These include, among others, greater growth in the bus and formula programs, more funding for state of good repair, new protections from the Freedom of Information Act for sensitive safety assessments, needed resources and realistic deadlines for implementing PTC, changes to a proposed liability cap for passenger rail and retention of current Buy America rules. Since it’s unlikely a final House-Senate bill will reach the President's desk before the current funding extension expires after Oct. 29, Congress is expected to pass another short-term extension in the coming weeks. With less than 100 days remaining before the statutory deadline for implementing Positive Train Control (PTC), APTA is working diligently to avert a Jan. 1, 2016, shutdown of commuter and freight railroads. APTA CEO & President Michael Melaniphy and Ed Hamberger, CEO of the Association of American Railroads, conducted live and recorded radio interviews all day on Sept. 22. The coast-to-coast media blitz was designed to educate the public about the PTC issue and the need for Congress to extend the implementation deadline. Melaniphy and Hamberger described the significant progress that has been made on installing PTC, as well as the urgent need for a new deadline because of continuing technical challenges. Next week, CEOs from commuter rail systems will join Melaniphy in Washington for more meetings on this issue with FRA officials and others. A bipartisan letter signed by 54 members of Congress was sent to the leaders of the House Ways and Means Committee last week urging them to permanently restore parity between transit and parking tax benefits. The letter is intended to spur the House tax-writing committee into following the lead of the Senate Finance Committee, which approved a package of tax extenders in July that included an increase in the monthly transit benefit from $130 to $250. In a related action last week, the Broad Tax Extenders Coalition, a group of more than 2,000 businesses, non-profits and community organizations, urged Congress to “act immediately” to extend or make permanent several tax provisions that expired at the end of 2014 – including the transit tax benefit. The phrase “If you build it, they will come” clearly applies to high-speed rail. According to an APTA-commissioned survey, nearly two-thirds (63 percent) of Americans say they would be likely to use high-speed trains if they were available today. Support increases to 67 percent when respondents are informed about the cost- and time-saving benefits of this modality. The survey, which was released on Sept. 24, also revealed that the public strongly supports streamlining government regulations to promote real estate development near high-speed rail routes. See all of the results of the “High-Speed Rail in America 2015” survey here. 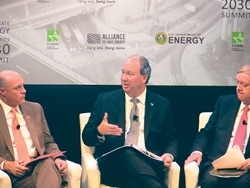 At a conference sponsored by the Alliance to Save Energy, Melaniphy discussed how the public transportation industry is contributing to the goal of doubling U.S. energy productivity in the next 15 years. Together with the presidents of Clemson University and Texas Tech, the CEO from Lime Energy and DOE officials, he made his remarks at the Accelerate Energy Productivity 2030 conference last week. In reminding the audience that our industry needs a multi-year authorization, he said, “Investing more in public transportation is an essential element to a comprehensive national energy strategy … If we are going to continue to play an increasingly vital role in energy policy, we need long-term resources." Only nine days until the start of APTA’s 2015 Annual Meeting! One of the highlights will be the in-depth Legislative Session on Oct. 6 featuring congressional staffers and APTA’s government affairs professionals. Hear the latest news from the experts. "The American people know we need a better transportation system. They want it. Let's give it to them. ... Use the Highway Trust Fund as the tool it was intended to be to drive outcomes in America."